It is with much excitement that I can announce our first printed publication, Little Book of Yarn Dyeing. Like many projects, this grew out of something quite modest. 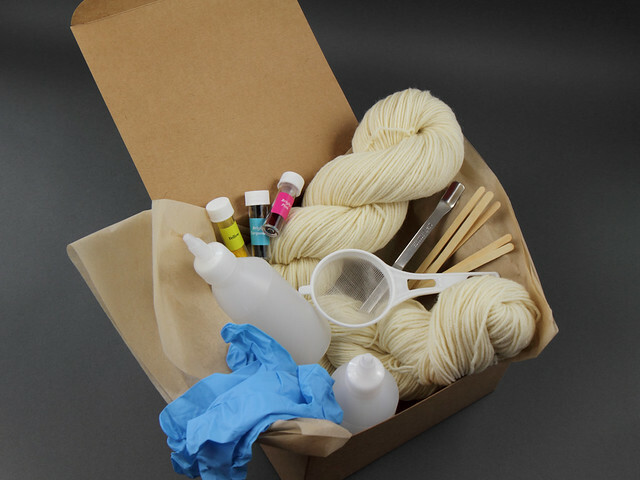 Last year I decided to put together a speckled yarn dyeing kit aimed at beginners. It has since become one of our most popular products, almost as popular as our hand-dyed yarn. We’ve had great feedback about the kit, so a few months ago I started sourcing materials for new kits for other dye techniques. The instruction booklet from the speckled kit therefore needed to be re-written and extended for those. 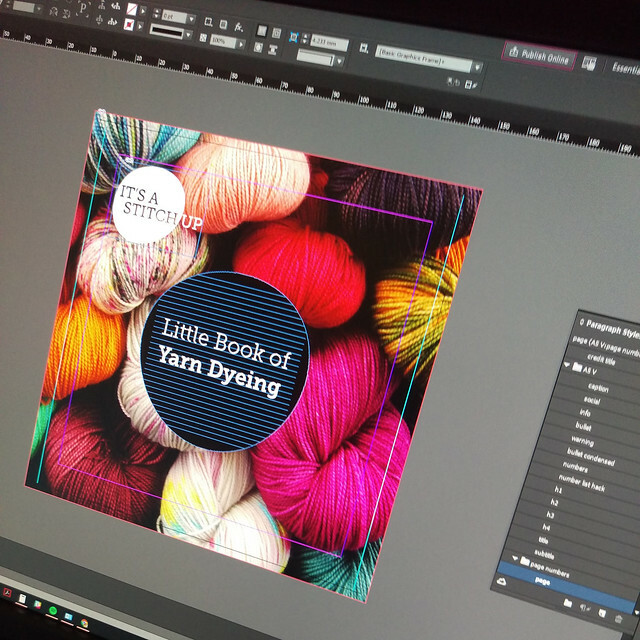 Our kits are packed to order because there are different yarn and colour options, and the instruction booklet printed on demand (which adds a fair bit of time to the packing process), so it made sense to look at printing it commercially. Before I knew it, this little re-write had expanded the booklet from being a set of single-use instructions, to a full-blown introduction to yarn dyeing, illustrated with colour photography. While it’s aimed at beginners, it also provides handy reference for those that have already caught the bug, so which we’ve decided to publish it as a stand-alone product. 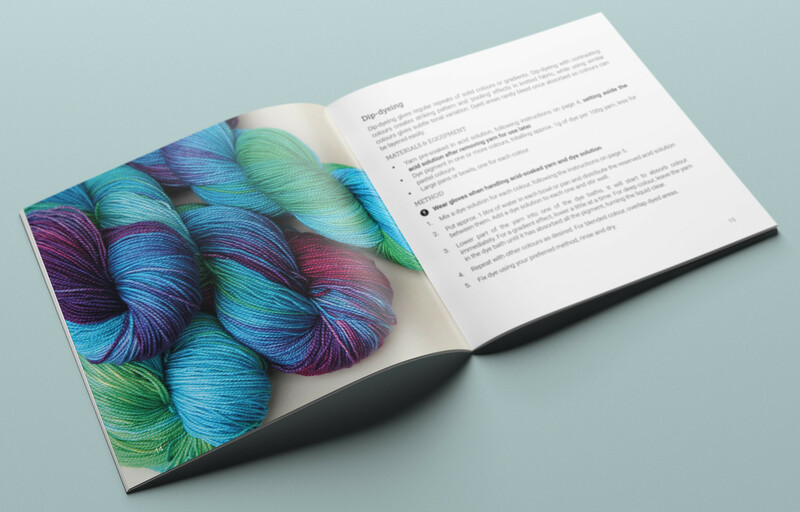 The booklet has instructions for four different dye techniques; speckle dyeing, dip-dyeing, immersion dyeing and painting; enabling the reader to achieve a wide variety of colour effects. It explains the dyeing process from start to finish, from choosing and preparing yarn to different methods of fixing dye, the role of dye chemicals and how to use them safely. Thanks to editorial assistance from Alice, I finished the book last week and I’m expecting the first batch back from the printer around 12 July. We announced the book being available for preorder to our Instagram followers a few days ago and I am overwhelmed by the response we have had already, with orders from across the globe. All being well, the first batch will ship towards the end of next week (a little later than planned due to me underestimating the book’s popularity and not ordering enough card-backed envelopes!). It’s not too late to order yours and be one of the first to receive it. There is an earlybird discount until Monday evening (UK time), but it was important to us to make the book affordable, so the regular price is only £4.50. So, back to the original purpose of the booklet, which was to make our dyeing kits bigger and better. We’ve just added a new Deluxe Yarn Dyeing Kit, which includes the booklet and the materials to try any of the dye techniques within it. The kit contains 200g pure wool yarn, either merino or British Bluefaced Leicester. Some of the reusable equipment (such as the dropper bottles and steel dye spoons) are expensive to buy individually and by buying in bulk we’ve been able to keep costs down, so we think this is a great-value starter kit. We have also been working to improve sustainability of our kits, the kit box and packaging are now British-made from mostly-recycled materials. The Deluxe kit is also available for preorder for with an earlybird discount. Once the booklets arrive the kit will be rephotographed and we hope to ship the first around the middle of July.